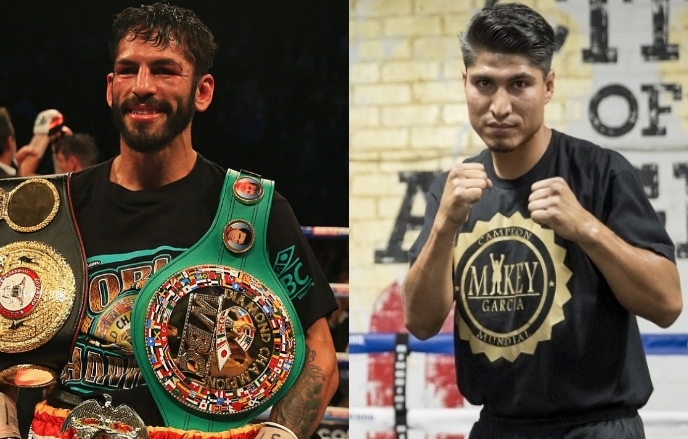 NEW YORK – Jorge Linares is the lightweight Mikey Garcia wants to fight most. Garcia is not so sure the feeling is mutual, though Linares doesn’t think Garcia will even return to the 135-pound division. Garcia, who defeated Adrien Broner by unanimous decision in their 12-round, 140-pound fight Saturday night, disputed Linares’ contention. “I still wanna do the Linares fight,” Garcia told BoxingScene.com. “Hopefully we can enter into discussions and talks with his team, Linares’ team, to get that fight before the end of the year. That’s the fight that makes the most sense. We would unify titles, we would have the best fighting the best. Garcia (37-0, 30 KOs) wanted to face Linares in a lightweight title unification fight this summer, but Linares’ representatives told Garcia he wanted to take another fight first. That’s what led Garcia toward boxing Broner (33-3, 24 KOs, 1 NC) in a fight Showtime televised from Barclays Center. Linares owns the WBA 135-pound championship, but he also is the WBC’s “diamond” champion at 135 pounds. Garcia won the WBC world lightweight title by knocking out Montenegro’s Dejan Zlaticanin (22-1, 15 KOs) in the third round January 28 in Las Vegas. Venezuela’s Linares (42-3, 27 KOs) will make a mandatory title defense against England’s Luke Campbell (17-1, 14 KOs) on September 23 at The Forum in Inglewood, California (HBO). Campbell is the No. 1 contender in the lightweight rankings for both the WBA and WBC. Garcia will watch that fight intently as he plots his next move. For more on Garcia possibly facing Crawford at 140 pounds, click here: https://www.boxingscene.com/garcia-know-if-top-rank-make-crawford-fight-with-me--118882. For more on Garcia potentially boxing Vasyl Lomachenko at 135 pounds, click here: https://www.boxingscene.com/garcia-im-interested-see-lomachenko-moving-up-135--119015. This fight needs to happen.